If you have a laptop, you have instant computing wherever you are. Using a laptop means that you can always stay connected, keeping work and entertainment near at hand. Unfortunately, using a laptop also means that you have big problems, largely relating to security: As the recently released hacking tool Firesheep makes clear, every time you open your laptop and connect to a Wi-Fi hotspot, you're in danger of having your identity stolen. When you connect to a public Wi-Fi hotspot, such as at a café, you can be hacked--all too easily. The free Firesheep Firefox hacking add-on is disturbingly simple to use: With it almost anyone can intercept your private information and then log in as you to many sites, including Amazon, Facebook, Flickr, and Twitter. You can--and should--protect yourself. The free BlackSheep Firefox add-on can help, but not greatly so, because it works only in Firefox and merely warns you that you're being hacked (as opposed to actually doing anything about it). I've also had problems installing BlackSheep. A better bet is to use a virtual private network, which encrypts all of your communications over a hotspot so that hackers and snoopers can't reach it. 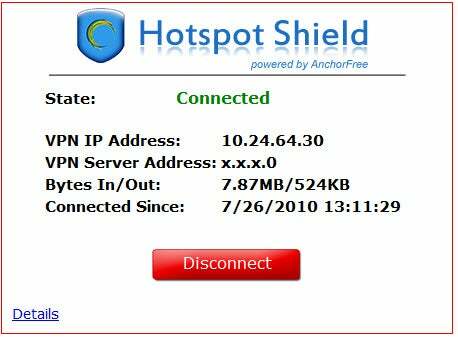 If you don't want to spend any money, try VPN program Hotspot Shield. Run the application, and it pops open as a browser window that tells you it's at work. When you surf the Web with Hotspot Shield active, you're protected via the secure HTTPS protocol. The program pipes ads into its browser window, and it also might pop up ads at the top of Web pages you visit. When you install it, make sure to uncheck boxes that allow the program do things such as change your default search engine. Firefox users have another free option: HTTPS Everywhere. This free add-on encrypts most of your Web communications when you use Firefox. It can't encrypt all content on sites that incorporate material from third parties, though. The add-on will let you know when full encryption is active, and when it can encrypt only part of the communications. Forking over some dough lets you forgo ads and obtain full encryption. 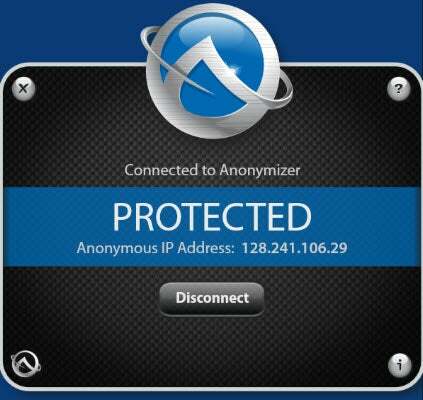 Anonymizer Universal is a solid for-pay VPN. Once you've set it up, using it is a breeze--just click a button. At that point, use the Internet as you normally do; your communications are secure and protected. The main drawback of this program is its price: $80 for a one-year subscription. If you prefer a less-expensive, pay-as-you go model, a great bet is AlwaysVPN, which charges on a per-gigabyte basis. That way, if you need a VPN only infrequently, you can save a good deal of money. For $8.50, you get 5GB of bandwidth use; the pricing scales up to $47 for 80GB for more-frequent users. 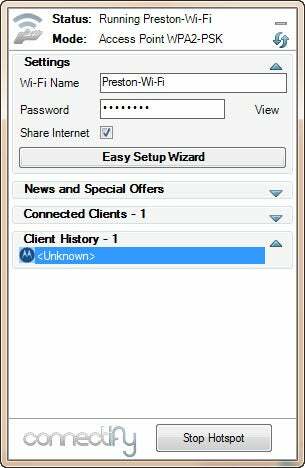 To use AlwaysVPN, you'll need to install AlwaysVPN's own version of the free OpenVPN software. Once you've done that, you can connect with a click or two, and you're protected. Windows includes only a very basic tool for finding and connecting to Wi-Fi hotspots. A better bet is Xirrus Wi-Fi Inspector, which shows you any nearby hotspots using a radar-like display. You get detailed information about every hotspot, including the strength, what kind of network it is (802.11n, for example), the router vendor, the channel on which it transmits, and whether it's an access point or an ad hoc network. It even shows you how physically far away you are from the network. The program Connectify is useful for laptop owners, as well. With this tool you can turn your laptop into its own hotspot so that other people can share your Internet connection. If your group is at a location with only an ethernet connection to the Internet, for instance, you can bring your wireless friends or colleagues onto that connection. And if you're at a for-pay hotspot, one person can establish on the laptop a single for-pay connection that everyone in the group can use. 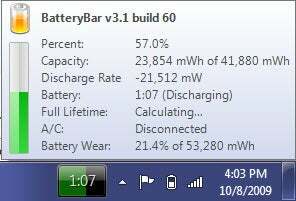 Another practical tool for laptop owners is BatteryBar, which shows on your taskbar exactly how much juice your machine has left so that you don't run out of power during an important task. You can learn not just how much of the charge remains but also details such as the total battery capacity, the discharge rate, the battery wear, and how much total capacity your battery has in terms of time per full charge. If you have other computers in addition to your laptop and you want to keep them in sync, SugarSync is a great tool. It automatically synchronizes files and folders among multiple machines so that your latest work is always within close reach. It doubles as backup software, too, because it also saves files and folders to cloud-based storage. You get 5GB free; to get more, you'll have to pay fees starting at $50 per year for 30GB.